The suspect told police he bought vodka, rum and wine and started drinking at around 12:30 p.m. before going on a rampage that left two people dead and others wounded. 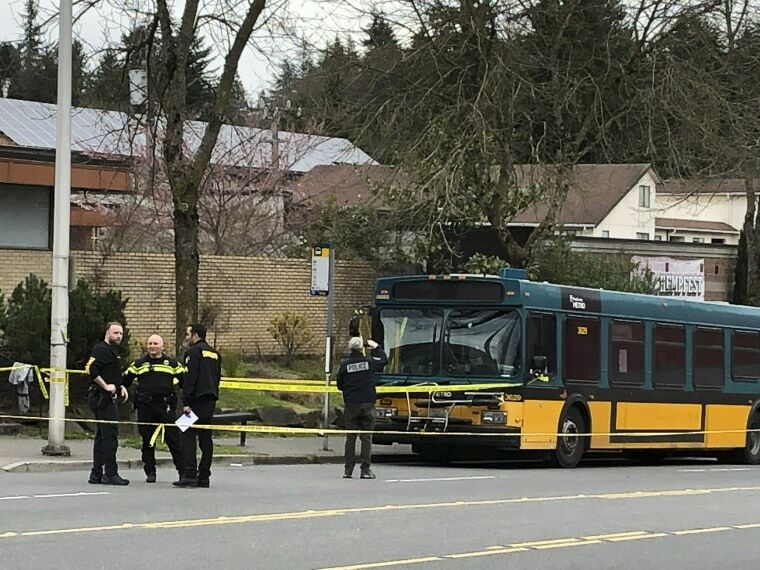 The man accused of opening fire on drivers and a bus apparently at random in Seattle on Wednesday, told detectives he is an alcoholic who blacks out when drinking and that he does not remember the rampage, according to court documents released Friday. The King County Prosecutor's Office on Friday were filing two counts of first-degree murder and three counts of attempted murder against Tad-Michael Norman, 33, accused in the shootings and car crash in north Seattle just after 4 p.m. on Wednesday. Authorities say Norman left his home with a handgun, shot and wounded a woman in an attempted carjacking and then shot at a bus and wounded the bus driver before killing another man in a carjacking and then killing another driver in a head-on collision. A probable cause document in the case says that when Norman was arrested he appeared intoxicated and identified himself as "John Doe," and that after he was released from the hospital for injuries from the crash he told detectives he is a recovering alcoholic who gets blackout drunk when he drinks, and that he did not remember the shootings, carjackings or deadly collision. The document says that Norman told police he bought vodka, rum and wine and started drinking at around 12:30 p.m. that day and he remembered playing video games on an Xbox. "He had no memory after that until he regained some memory function when he was in the hospital,” the document reads, referring to statements Norman allegedly made. "Detectives recounted a summary of what we believed happened including him shooting 3 people, carjacking a vehicle and being involved in serious vehicle collision. Norman said he has no memory of any of that," the document says. The document says Norman "described the nature of his alcohol abuse as blackout drinking, meaning when he drinks he drinks to a point of black out." Court documents say Norman was armed with a Glock 9 mm handgun. It is not clear if Norman has an attorney. He is being held in jail without bail, according to jail records. The two people killed in the shootings and crash have been identified as Robert M. Hassan, 76, who died of a gunshot wound to the head, and Richard T. Lee, 75, who died of blunt force injuries sustained in the head-on crash, according to the King County Medical Examiner’s Office. The bus driver who was shot, Eric Stark, has been called a hero for backing up the bus and getting the vehicle to safety despite being shot. Stark, 53, told reporters at Harborview Medical Center in Seattle where he was being treated Friday that as he turned the bus around a corner onto the road, he saw a person running and he thought the man was running to catch the bus. "And he tripped and fell and just face-planted the pavement," Stark said. “And I thought, ‘oh, no, the guy’s probably hurt,' I’m probably going to have to call — you know, he’s probably going to need medical attention." “I saw him roll over onto his back, and his arm was out to the side, and I’m like, ‘is that a gun in his hand?’ Stark recalled. He recognized what looked like a Glock handgun, and then the man stood up and calmly got into a shooting stance and fired. "That’s when I said to myself, I think I said out loud, ‘I think I’ve been shot,'" Stark said. He ducked down and took some cover behind the fare box, and then backed the bus up and eventually moved it down a side street. None of the approximately 12 passengers on the bus were injured. Stark said that he does not consider himself a hero, and that any King County Metro driver would have done the same thing. Stark, a former pastor and father of five children, four of them adults and the youngest an 8 year old, said that his faith helped him in the crisis. He also has two grandchildren. "The first thing I thought is, 'Honestly, I'm not afraid to die. I'm a Christian,'" Stark said. "But I said to myself, 'I don't want to die today.'" Stark also said he is eager to get out of the hospital and get back to work. His doctor said Friday that he is doing very well, and a tube inserted into his chest could be removed in the coming days. "I talked to one of the passengers on my bus, she called me yesterday here at the hospital, and I said ‘I’m going to be back out there,'" Stark told reporters. "'And I want you to come up to me. You see me, you come up to me and give me a big hug.'" Hassan was a retired U.S. Air Force colonel, a father of five and a grandfather of 13, his family said in a statement to NBC affiliate KING5 of Seattle. They said they mourn “the senseless loss” but “we also celebrate his life, his service to our country and to the Seattle community.” Hassan served as a Navy flight surgeon and a U.S. Air Force “full bird” colonel flight surgeon and also spent five years in the Air Force reserves, they said. Norman was a vendor with Microsoft, and his contract ended last year, a company representative said, according to The Associated Press.